100 fathoms below.... The depth at which sunlight no longer penetrates the ocean. 1983. The US nuclear submarine USS Roanoke embarks on a classified spy mission into Soviet waters. Their goal: to find evidence of a new, faster, and deadlier Soviet submarine that could tip the balance of the Cold War. But the Roanoke crew isn't alone. Something is on board with them. Something cunning and malevolent. Trapped in enemy territory and hunted by Soviet submarines, tensions escalate and crew members turn on each other. When the lights go out and horror fills the corridors, it will take everything the crew has to survive the menace coming from outside and inside the submarine. In the dark. 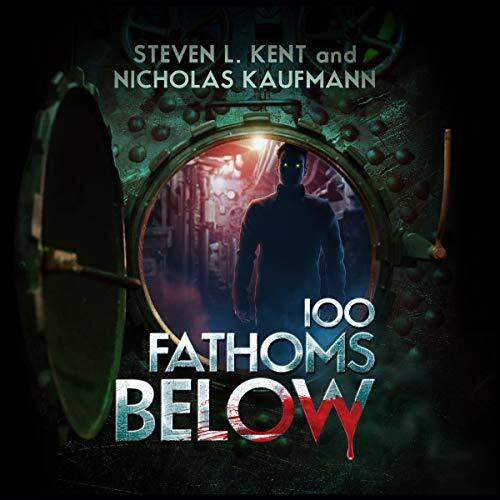 Combining Tom Clancy's eye for international intrigue with Stephen King's sense of the macabre, 100 Fathoms Below takes listeners into depths from which there is no escape. A Publishers Weekly Editors' Choice for Fall in Science Fiction & Horror.